Home Butterfly & Bee Mixture. 1/2 Acre Pack. A blend created to attract and maintain bumblebee populations in Ireland. 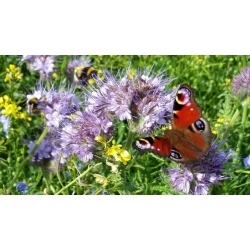 Phacelia acts as a prolific flowering nurse crop whilst the red clover and sainfoin establish. The phacelia will produce a fantastic display of purple flowers that bees will love. Excellent and colourful mixture to attract bees. Mixture Formulation – 2.5kg pack.